In June the scene above will become the most talked about concert venue in the world when Gustavo Dudamel and the Simón Bolívar Symphony Orchestra of Venezuela give an outdoor concert in Raploch, Stirling. 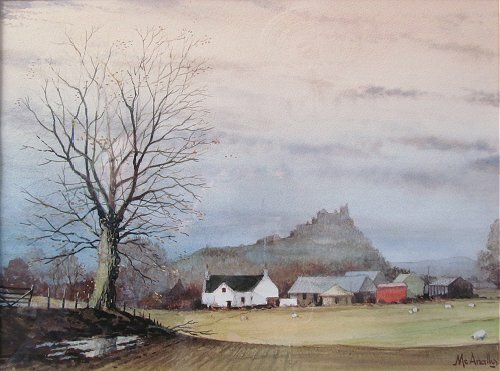 Scottish artist Bill McAnally's watercolour shows Stirling Castle which will provide the spectacular backdrop for Gustavo Dudamel's concert on midsummer's day June 21, 2012. The original painting hangs in our dining room as a reminder of the years we spent living on the edge of the Raploch in the 1980s; it was here that our son started school and our daughter was born. Gustavo Dudamel's concert is being staged by Sistema Scotland and is part of the visionary Big Noise Raploch project which is working to create a children’s orchestra centre. Almost all the ingredients are in place for an unforgettable concert in June, a world class conductor and orchestra playing in a magnificent natural setting to promote music education. What more could we want? Well, I think we need a sense of balance. Gustavo Dudamel is indisputably very talented, but I wish he would spend a little less time studying his scores and a little more time challenging his PR advisors. Recently Newsweek ran a profile which hailed Dudamel as, among other things, "the saviour of classical music" and I am sure we will hear more of that kind of hyperbole before the Raploch concert. Please do not get me wrong, Gustavo Dudamel has done some fine things and will doubtless go on to do many more. But classical music has many saviours, and some of them have performed their miracles with precious little recognition in the very place that the Venezuelans will be barnstorming in June. Across the road from Raploch is the Macrobert Arts Centre on the campus of Stirling University and for many years the Macrobert hosted BBC Scottish Symphony concerts. The Macrobert (since refurbished) was the kind of venue that brought out the true mettle in orchestral musicians. An hour's drive from home base in Glasgow in treacherous Scottish winters, a cramped stage and acoustically dry multi-purpose auditorium. Yet the BBCSSO played its heart out for its Stirling audiences on so many occasions - thirty years later I can still recall a memorable Sibelius Sixth Symphony with Charles Groves, a Walton Viola Concert with Nigel Kennedy and even a Mahler symphony, the First, conducted if my memory is correct by Jerzy Maksymiuk. Back in 2002 the BBC Scotish Symphony Orchestra started its education activities with 'Toy Symphony'. This innovative project brought together new technology, orchestral musicians and primary school children in Glasgow's blighted East End to perform together at Glasgow Royal Concert Hall. There have also been many notable additions to the record catalogue from the BBCSSO ranging from the modernism of Jonathan Harvey to the late-romanticism of Sir Alexander Mackenzie. 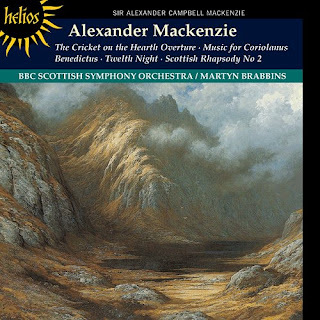 Why Mackenzie's Benedictus, which is on the Hyperion CD seen below, is not as well known as Barber's Adagio I do not know. That other fine ensemble the Royal Scottish National Orchestra was also doing wonderful work when we were living in Scotland with concerts in Glasgow and tours to Dundee and other cities. My EMI colleague Christopher Bishop was their managing director at the time and memorable projects include a Martinů symphony cycle with the late and under-rated Bryden Thomson (thankfully recorded for Chandos) and a 1990 Musica Nova festival that brought John Cage to Scotland. Today the RSNO continues its education activities which include schools' concerts. So let's celebrate music education in Raploch in June. But let's also remember that classical music has many saviours who have worked tirelessly over the years to bring music to the people, just a few of who are mentioned here. And we should not forget that although youth no longer features in the name of the Simón Bolívar Symphony Orchestra of Venezuela it still does in that of many outstanding British orchestras. I thought this a lovely and vital post, Bob. Thank you. The heading brought to mind something I came across a few days ago by chance. This is on a minor scale compared with the programmes you discuss, but it seemed to me to have merit, more than one might think at first blush. I was looking in the NML for C.P.E. Bach's keyboard sonatas and decided to try a pianist name Ana-Marija Markovina. I was very impressed and so looked at her website. Now here was something different. Without a hint of PR hype, she is making a nice career, largely in Europe, but she is also working with Professor Helmut Reuter at the Institute of Psychology and Cognitive Science at the U of Bremen. A book in the works is on the neuro-psychological importance of learning an instrument as an adult. Something of Oliver Sacks, something of Brendel here, rather than blurbs, bosoms, and blether. I'm not surprised also that Badura-Skoda, one of her teachers holds her in such esteem. Anyway, with Reuter she has been exploring "the cultural psychological significance of works in the spirit of their time," and out of this come recitals with rubrics such as 'Nights of Romance and Irony' and 'Russian Soul'. Both Markovina and Reuter feel that this approach will open to the public a new mode of musical understanding, and the rubrics may be intriguing enough to attract the attention of those who otherwise might little think of attending concerts, though 'Russian Soul' needs to be changed to something a little less Victor Hochhauser. A small thing, perhaps, but it all adds up, and we need everything good and serious we can get in this cause. If ever there was an understatement about the condition of music today, it is yours that "classical music has many saviors." Thank you for pointing us yet again toward that which should be obvious to even the most casual observer. What really irks me about Dudamel articles is that they're written by people who have never attended a classical concert and thus assume that they never sell out until now, that only Dudamel can pack the house. These articles also give zero credit to artists are arts organizations that have long had apprenticeship programs for young artists. A good historic example is the program George Szell ran where he'd personally train young musicians over a several year period -- James Levine was among the alum.